Grafton had two sides to it. Always has had. There was nature on one side: the trees of spun gold, flame red and deep mauve. Carpets of mauve blossoms covered the bitumen roads in spring. The Jacaranda Festival, held each year in November, was like the fertility rites of pagan times. I wore a new floral skirt, a white blouse and for my neck, a crepe paper ley in many shades. School children danced around a tall maypole, spinning multi-coloured ribbons around it during the school celebrations. A Demeter-like queen was chosen for the year. One time it was an ex-schoolmate of mine. Still, I remember above all the flowers, the trees and the animals. We lived opposite Grandma’s farm. The bitter-sweet smelling lantana bush at the side steps always had butterflies sipping at its purple-and-white flowers. There was a grape trellis in the back yard for shade, under which we feasted on watermelon, loqats, grapes and mulberries grown on the farm. An old barn covered in an orange trumpet vine drew townspeople in cars to gawk at it from the highway. Horses and yellow-and-white jersey and guernsey milkers grazed in the paddocks. A red bull stamped on the others side of the barbed wire fence. Two uncles, Eric and Bargy (pronounced /bah…ghi/) ran the farm, but Grandma was the boss. Other uncles came to visit from time to time. There was the one-legged barber uncle, the fat uncle who drove Gilbarco trucks, the famous cyclist and “black sheep” of the family, nicknamed Cyclone Johnny, and the Hollywood look-alike, Uncle Stan, who sometimes escaped his wife in Sydney. (“She gets crankier every year!”). Riding horses was, and probably still is, the main entertainment for the young, especially girls, in the country. I joined the local pony club and went to gymkhanas at the showground. When I got older I wanted more, and gravitated to cities,first Sydney, then overseas to London and Paris, where I lived for four years. But a country life stays with you forever, the flavours, smells, views and sounds of nature are what inform my voice, when I write fiction and memoir now. My adult daughter, born in the eighties, drew my attention to the above song recently. I’d told her stories about growing up in South Grafton, and she had fond memories of her grandmother and great-uncles. She started listening to the lyrics and felt the nostalgia therein. “Flame Trees” is a song by the rock band Cold Chisel from their 1984 album Twentieth Century. One of the members of the band, Don Walker, grew up in Grafton. 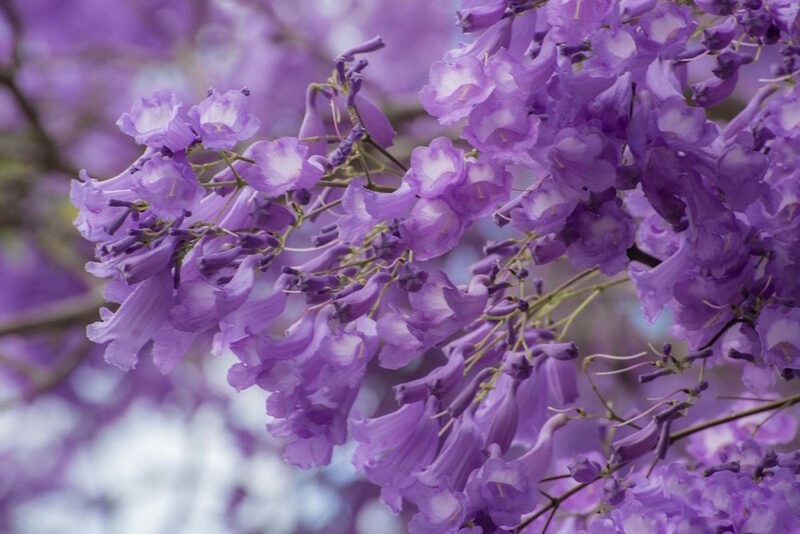 He knew about how the jacarandas, as well as the many flame trees, set the country town ablaze every spring. In fact, the real flame trees are the jacarandas. I love the way the YouTube video above presents the two sides of the country town where I grew up. Many of the images, the crooked lift bridge and the hotels, are authentic and memorable still for me today. An easy read and kick starts so many memories for me … As children my friends and I spent a lot of time tree climbing. Right there in our backyard there were two trees in particular that just cried out to be climbed; a huge old mulberry tree right at the back fence and a coral tree also near the back of the block. You have to be from the area to understand the distinction of having lived in “South” Grafton. Yes, a good point. I explain it as the “poor cousin” of the main north side of town, when I was growing up. Dear Anne, that video is a real mess. It’s all over the road (as rough lads used to say in South Grafton) like a mad woman’s sh–. More politely, I might say that it has neither head nor tail. It’s just a pile of scraps stuck together with dull glue. A homosexual mate of John W and me in Sydney liked to talk of “a pile of clichés tied together with pink ribbons”. There’s neither continuity nor harmony. The video jumps from one thing to another. Where on Earth did you find it ? Did you make that video from scratch ? Well I thought it was great! Glad it looks all right from your perspective, in any case. And thanks for stopping by.